This year, however, the market has fared poorly, with developers doling out properties for steep discounts—to the dismay of many recent buyers across the country. While the ambitious promotions had only marginal effects in boosting sales, they left many recent customers feeling cheated about the cost of their new homes. On Oct. 4, the sales office of another Country Garden project in Jiangxi’s Shaorao city was pelted with eggs thrown by hundreds of angry buyers, who also destroyed the office decorations while demanding refunds. During the Golden Week, the company had lowered prices to 7,000 yuan per square meter from 10,000 yuan. Similar protests broke out in other Chinese municipalities, including the eastern cities of Hangzhou, Hefei, and Zhangzhou, and Pingdingshan in central China. On Oct. 5, a Country Garden project in Pingdingshan, which is in central China’s Henan Province, gave a 20-percent discount to promote sales, inciting previous buyers to attack the local sales office. 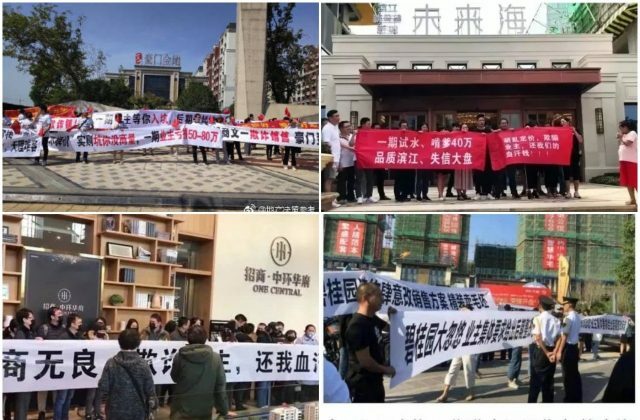 One Capital, a real estate project in Zhangzhou, a city in southern coastal China’s Fujian Province, multiple homeowners held banners to protest after the company had lowered the price to between 12,000 and 14,000 yuan per square meter from 18,000 yuan. According to data from CITIC Jiantou Securities, total sales during Golden Week this year were the lowest since 2014, even as developers in almost all Chinese cities offered generous discounts, free cars, and even 10-percent down payments to attract customers. Shanghai Securities News reported that Shenzhen and Beijing are the two most active cities in the real-estate market. But in the most recent Golden Week, sales were down by half compared with previous years. In Shanghai, two projects in the districts of Songjiang and Jiading offered discounts of 11 percent. And if the buyer knows an employee of the property company, a further 2 percent discount was applied, as well as a coupon valued at 30,000 yuan ($4,300). Another project in Baoshan district gifted BMW cars to buyers as an enticement, with the option of receiving 300,000 yuan instead of the car. In Hefei and many other cities, on top of a more than 10-percent discount, property companies also promised to help the buyer secure local registration in China’s residential permit system, known as hukou, that determines one’s rights to education, employment, health insurance, and other benefits. Zhou Qiang, a Beijing real-estate analyst, told Radio Free Asia (RFA) that the most important factor behind plummeting housing prices is state interventionism. Another Beijing real-estate expert who spoke with RFA commented that the government may freeze the market to prevent its collapse.